I am passionate about raising awareness for women’s health and talking about the “taboo” topics, which is why I am proud to be an Ambassador for the Australian Cervical Cancer Foundation and Endometriosis Australia. Chocolate, ice cream and pain killers might help some women during that time of the month but due to my Endometriosis (and Adenomyosis) I feel like my whole world stops. I have had to pull over while driving because of the pain. It baffles me that a disease affecting so many women is still not spoken about; even Microsoft Word doesn’t know about it because it keeps trying to correct my spelling to optometrist! 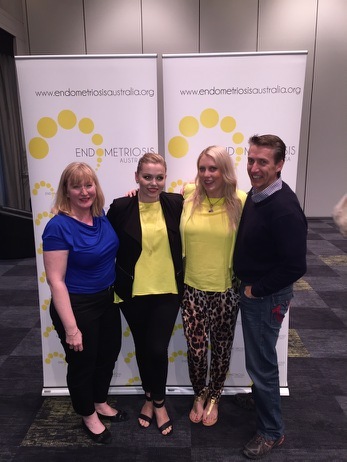 A close friend was experiencing so many of the symptoms and I stomped my feet on the ground until she made Doctors investigate – turned out she had Endometriosis. To be in that much pain so frequently, is not normal. See a Doctor and have a laparoscopy. It’s the only way to diagnose it. There needs to be more education and understanding as well as empathy for women struggling with Endometriosis. We’re not exaggerating – when we’re in pain, it is awful. And not to mention the emotional toll it takes on you. Many women have infertility issues and that is haunting for some. I hadn’t even heard of Endometriosis until I was rushed to hospital while living in Canada and the Doctors there said I looked like I had ‘text-book Endo’. It was the reason I moved back home yet it still took me years to be diagnosed. My diagnosis was actually an accident as it was picked up when I was having an operation for Cervical Cancer. Had I not had that it would have taken me longer to get the treatment I needed. I have an incredible Gynaecologist who has also diagnosed me with Adenomyosis as well as put me onto a team of people who are helping me manage my symptoms and flare ups. If you have Endo (or Adeno), make sure you try different diets as certain food can exacerbate symptoms. Chat with your GP and make the time to see a dietician or nutritionist who has experience dealing with these specialised diets. Exercise is extremely important as being overweight can make the whole situation worse. I understand that on the bad days you can hardly walk, but on your good days you need to force yourself to get active. Yoga is particularly helpful and there are studios that specialise in classes for women with Endometriosis – so hunt them down! Life can be hard, full of tears and wearing leggings (or my new favourite, jeggings) but I promise when you find a way to manage the bad days – life gets easier.